Music plays a vital role in enhancing and enriching our worship at St. Andrew’s. St. Andrew’s Minister of Music is Brad Norris. 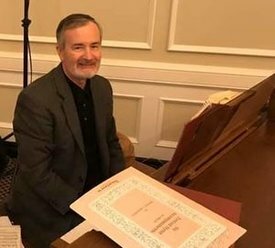 Along with worship services, he teaches Musikgarten classes for toddler and preschool age children, accompanies various community choirs, performs in occasional public concerts, composes and performs choral church music and is active in the local fine arts community. Check back for the next scheduled class! 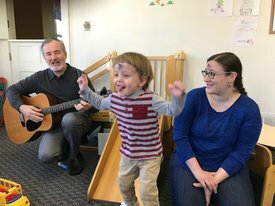 Throughout the year, St. Andrew's offers a tuition-free Musikgarten class for preschoolers ages 0 to 5, accompanied by an adult. Classes meet on four successive Thursdays beginning at 9:45 a.m. For more information, please call 595-0371, ext. 216 and leave contact information. 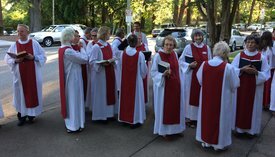 Our Adult Choir rehearses weekly (not always on the same night to accommodate schedules) and leads the music at the 10:30 a.m. service on Sunday morning. We are incorporating some of our talented teenagers into the Adult Choir, as their schedules allow. For more information or to get involved, contact Brad Norris, 595-0371, ext. 16 or saec.brad16@verizon.net. The purpose of the Moving Spirit Liturgical Dancers is to spread and share the love of God through movement, music, and mime, to bring the joy of god’s love to and help raise funds for those in need. To learn more or to get involved, contact Patricia Woodbury, 930-2755 or ppwunicorn@cox.net. Sound technicians manage the equipment that enables worshippers to hear what's happening during each service. Training is provided. Contact the church office, 595-0371 or saec0371@verizon.net. Click here for St. Andrew's smartphone ringtones!